My works are explorations using geometric abstractions to create what I call imaginary architectural environments. Influenced by the architecture of Mesoamerica and the sleek lines of modernist design, my work investigates geometric spatial arrangements using an elemental and minimalist sensibility. The circle and the square are major components in my work. I believe when things are at their most elemental, they reveal to us their essence. I consider my works “constructions” that layer and arrange form. They are intuitively driven and seek simplicity in composition that invites the viewer to move into a place of speculation. The works are inspired by subjects as varied as news headlines and personal observations about politics, science and nature. In this series, I have referenced the work of Joseph Cornell. 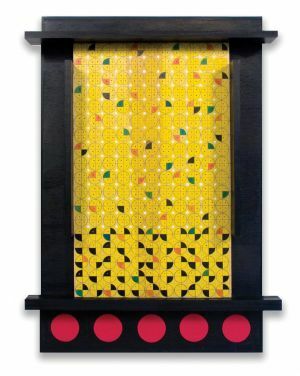 His wooden box assemblages were the impetus for developing my compositional works on wood. Originally, I created a series of box paintings. The works quickly transformed into larger investigations that involved moving out of the containment of the box. I decided to use an elongated horizontal format to facilitate movement and create a rambling expansiveness. I call these pieces “sections” because they allude to being a small part of a much larger whole. Linda Arreola is a Los Angeles-based artist who has been working and exhibiting her art in Southern California for over 25 years. She produces work in a variety of media including painting, sculpture, installation and printmaking. 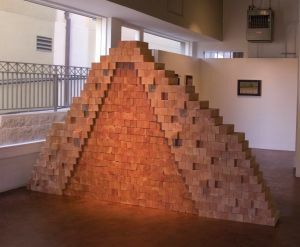 Arreola has earned two Master’s degrees—one in sculpture from California State University, Los Angeles and one in architecture from the University of California, Los Angeles. She is a featured artist in the book Contemporary Chicana and Chicano Art,published by Bilingual Press in 2002. The County of Los Angeles commissioned her to create a public artwork, which she completed in May 2008 for the East Los Angeles Civic Center main plaza. She received a Durfee Foundation ARC grant in 2008 and is a recipient of a City of Los Angeles (C.O.L.A.) Cultural Affairs Individual Artist Fellowship for 2010. She has been a member of the Southern California Women’s Caucus for Art for over 20 years.